What a difference a Davos makes. Until yesterday, China’s President Xi Jinping was cast by many in the international media as a Mao Wannabe: Someone interested primarily in political supremacy at home, locking up lawyers and political activists and cleaning up the Communist Party, while pursuing an assertive policy of projecting Chinese power abroad. Xi was in command, looking to possibly extend his tenure. All of that had been quite disturbing to many observers outside China (that is, when they weren’t talking about his “challenges” and how any day now—any day now—there would be a backlash from society that would threaten Party rule). 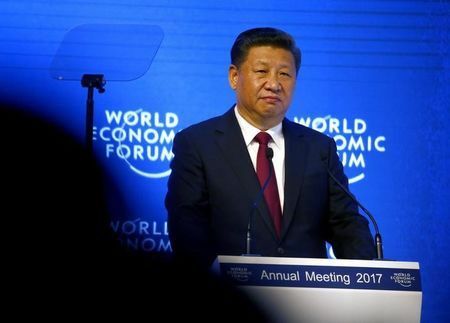 Suddenly, following his lengthy speech at Davos, Xi’s become to many the Great Global Stabilizer, interested in securing trade, opening economic frontiers, expanding commercial cooperation—in a word, what’s been known by many outside China for decades as “globalization”—a term that Xi was careful to qualify by speaking of “economic globalization” [经济全球化]—namely, untrammeled trade for China though not open borders where outside ideas from other societies are allowed free rein. Nonetheless, for a world terrified by the election of Donald Trump as the next American president, Xi and his speech are being cast as a vote of confidence in the existing world order. Local residents and local Chinese companies here don’t quite understand what the fuss is all about. Their views are varied to be sure; yet more than a few, even in affluent provinces, are anxious about their own economic futures. Many see Beijing as having been very good at bringing benefits to a narrow elite (what Marxists used to call the “comprador class”), while not caring all that much for small businesses and entrepreneurs trying to break into markets, local and otherwise. Some residents see the factory floors and offices in large industrial parks and innovation hubs under construction as already reserved for the well-connected and the well-heeled, with little prospect for themselves. They understand that when Xi is talking about “globalization”, he’s referring to globalization with Chinese characteristics. When Xi praises the status quo, he’s signaling that China is relatively satisfied with its position—and that citizens and local officials should follow suit. Not everyone here will be persuaded. Many locals here wonder when their children will get to study abroad like their classmates who can afford private tutoring; when their prospects and the small business they’re trying to run will be as good as those who they see as politically-connected, tied into the local power structure where the government still dominates the market. Of course, there’s growing entrepreneurship. But while Alibaba might be seen as a sign of China’s innovative spirit by many observers overseas, for more than a few residents here, Taobao is a place to buy goods cheaply, not a platform to expand their business and grow their income and place in Chinese society. There’s also a political context to this sort of local unease. Websites and social media extolling Chinese pride (and the need to keep foreign goods at bay) often stoke local sentiment of being sidelined by economic policies which may play well inside China’s beltways but have little impact on the country’s many counties. China’s conservative intellectuals do have a stronger presence here that they usually given credit for, and Xi and his like-minded comrades haven’t been very interested in countering their narrative of a country that’s been shortchanged by foreign forces and foreign companies. Xenophobia is far easier to tap into here in China than it is in the United States. None of the local disquiet that does exist means that social revolution is simmering; that farmers will be aligning with students and “China’s new generation” (whatever that means this week) to challenge Communist party rule. Nor is the opposite suddenly true here: That Beijing’s rule is especially robust and getting stronger, squeezing out the last breaths of a suffocating civil society and dictating local policies without pushback. Both scenarios are absurd, written from far, far away in what could be another galaxy entirely. For many here in China, Xi's vision is sound and it's secure. At the same time, what Xi’s speech does connote is very much business as usual for Local China. For the well-positioned in China’s beltways and beyond, that’s delightful news. For the rest, it’s really no news at all. Davos to them makes no difference. It says quite a great deal about the bizarre nature of many analyses about China and politics here that these two very different views—that Xi’s in charge and that Xi’s in trouble-- often coexist, sometimes from the same commentators within a very brief time frame. There may be some discontent, but surely living standards have been improving for the average Chinese in the past few years? Thank you for your comment. Yes indeed-the lives of many local residents have improved enormously. Too much is made of discontent by many outside of China. Davos and Xi's presence is important to elites but not to those trying to reach a yet higher level of income and status here.